Multi-row necklace in antique look. A gorgeous piece of jewellery for the big occasion is what you get with the Schuhmacher multi-row chain, which presents itself in a trendy vintage style. 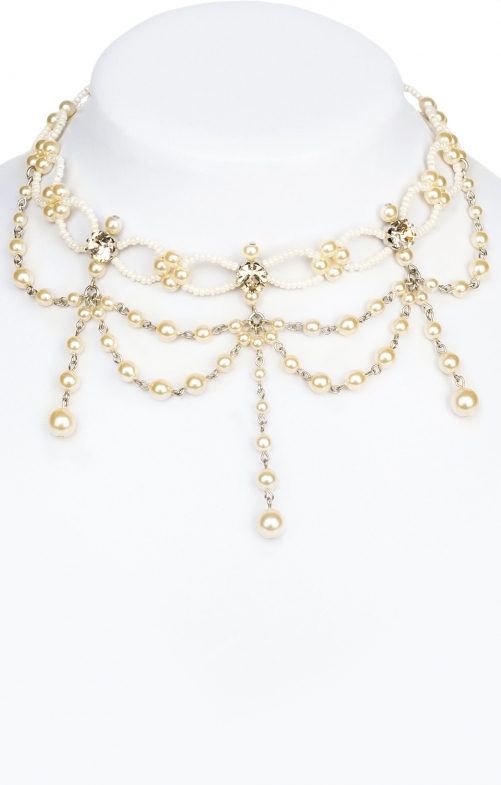 The necklace consists of small, tightly knotted champagne coloured glass beads, different sized crystal beads in iridescent champagne, white and gold tones. The crowning glory of this adorable accessory are three large, rounded crystal stones that reflect the light with their brilliant cut. Depending on your mood, the necklace can be worn close to the neck or lowered into the neckline. Thanks to its discreet and harmonious colouring, it goes well with costumes and dirndls in almost all colours. Even Cosplay and Gothic outfits can be stylishly rounded off with this necklace. Einfach nur Wow!!! Traumhaft schöne Kette, die das i-Tüpfelchen zu meinem Dirndl (habe ich hier auch gekauft) ist. Ich bin total begeistert. Auch das Preis-Leistungs-Verhältnis stimmt.